We’re getting really close to the launching, what will be a massive update to SOAP Vault. The new billing system will provide a whole bunch of new functionality! Below are some features to expect. Currently, SOAP notes are directly attached to receipts. A big change is the separation of SOAP notes and invoices. You will have the ability to then add items to your invoices, and specify the price, quantity, and taxes for each. Initially, items added to your invoices will be limited to Services, but we will expand out into Products as well in the future. You will be able to apply payments towards invoices and as a result, will have the ability to track balances. Transactions can be payments or refunds. You can pay one or a few invoices at once using a variety of Payment Methods of your choice! It’s super simple! You will be able to track account balances for each of your Patients/Clients. You will also be able to pay invoices out of account credit. There will be a variety of key financial reports including Accounts Receivables, Invoice Reports, Transaction Reports, Patient Financial Statements and a few more. Many more reports will be released in the future as well. Payment integration through Bambora will come very shortly after the initial rollout of the new core billing features. 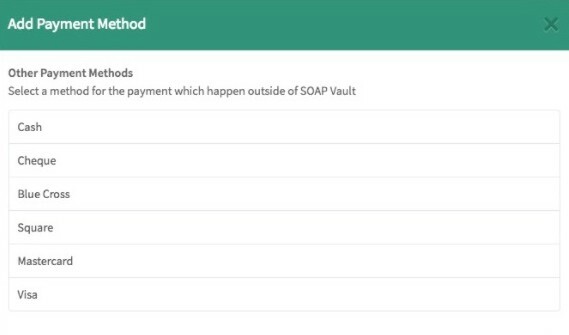 With this, you will be able to process payments directly within SOAP Vault to your Patient’s or Client’s credit card. You will be able to have the credit card securely stored in their profile for future use. Also, you will be able to configure your online booking to require a credit card or a complete payment up front at the time of booking. Be sure to register your Bambora account in advance so you’re ready to go when it’s released! Our price won’t change! Yup, just $19/month.